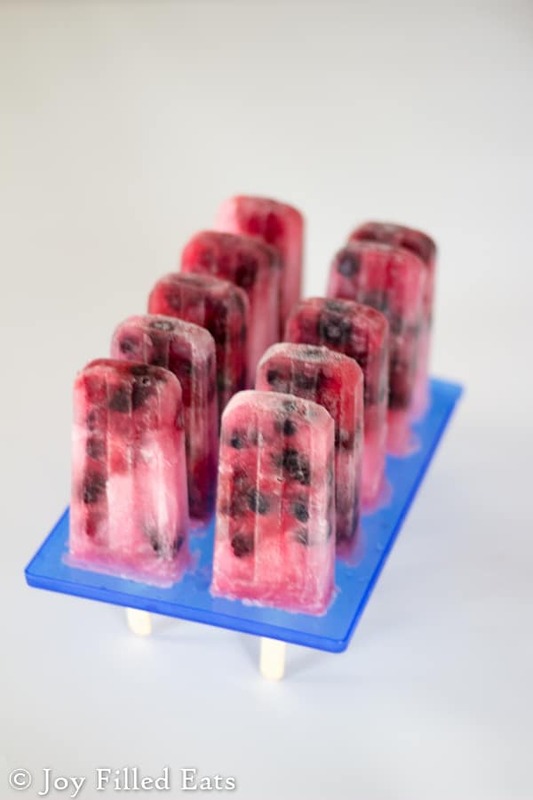 These Sugar Free Popsicles are as tasty as they are beautiful. 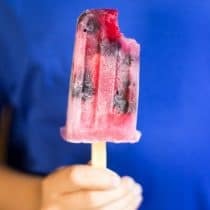 They feature blueberry seltzer which I sweetened naturally with a blend of erythritol, xylitol, and stevia and mixed berries. Since they are low calorie, low fat, and low carb you can eat almost as many as you want. These are so light and refreshing. 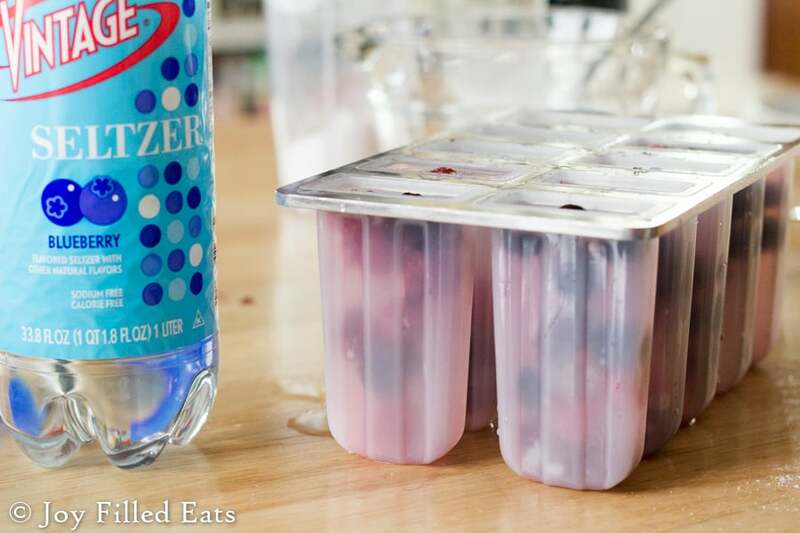 The seltzer keeps them from getting too hard and the berries add bursts of flavor all the way through. Every night at dinner at least one of my kids asks, “Mom, can we have seltzer?” About a year ago our seltzer obsession started. I had given up soda a few years before and then my husband followed suit. I didn’t like giving my kids juice or soda or chocolate milk but drinking water all day long can get a little boring. I began buying unsweetened flavored seltzer and it wasn’t long before all of us loved it. We drink at least a quart a day at dinner, sometimes two. About a month ago I was in my local grocery store and I saw cases of Pineapple Seltzer. Pineapple! Seltzer! I opened a bottle right there, took a sip, and fell in love. I walked out that day with 25 bottles of Pineapple Seltzer and another case of other flavors. 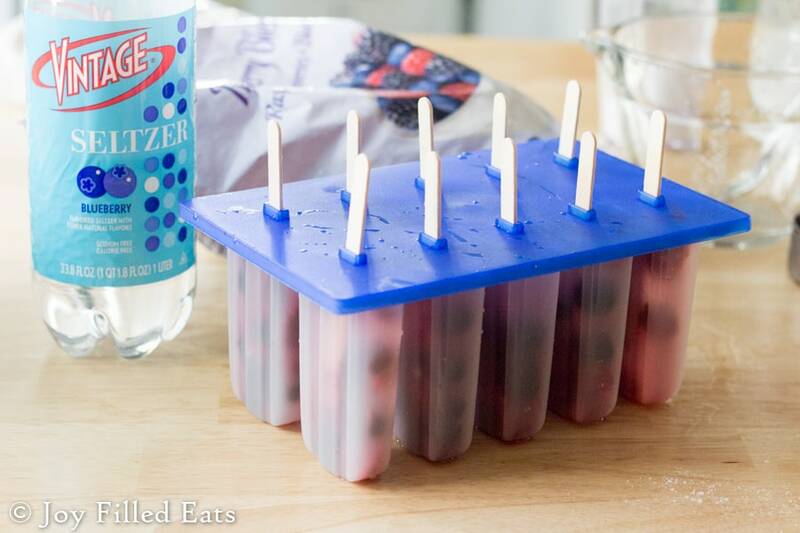 My kids love seltzer so using it in ice pops was a natural conclusion. The best parts about seltzer are it is made with natural flavors, has zero calories, is sugar/fat/gluten free, has no artificial sweeteners, HFCS or FDC color. As a mom, I feel good about letting my kids drink this every day. Did you know that adding seltzer your favorite homemade baked goods will give them a fluffier texture? sugar free sweetener, to taste, finely ground – I use my blend of xylitol, erythritol, and stevia – if you use another sweetener you may need to alter the amount. Mine is twice as sweet as sugar. 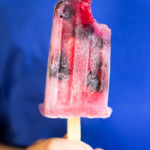 Need some other cool sugar-free treats? Try my Frozen Cookie Dough Bites, Frozen Hot Chocolate, Pina Colada Ice Cream, Chocolate Cream Italian Ice, and Homemade Vanilla Ice Cream. 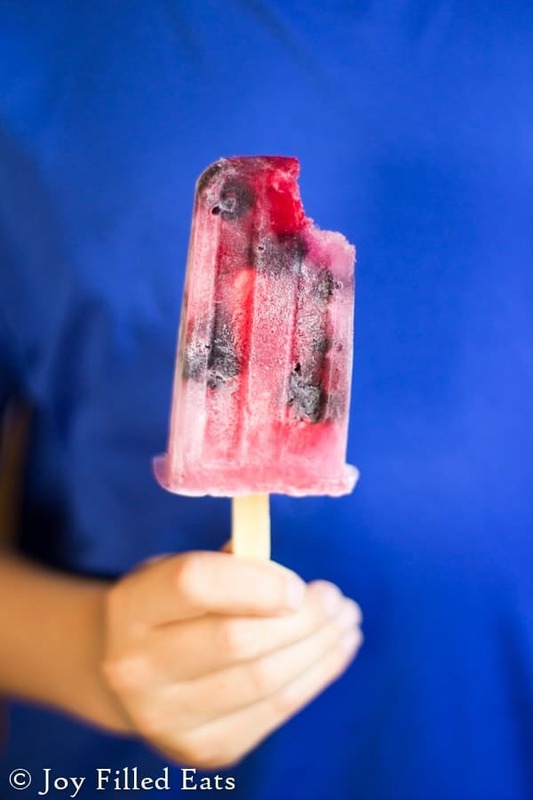 I hope you enjoy these Sugar Free Popsicles! 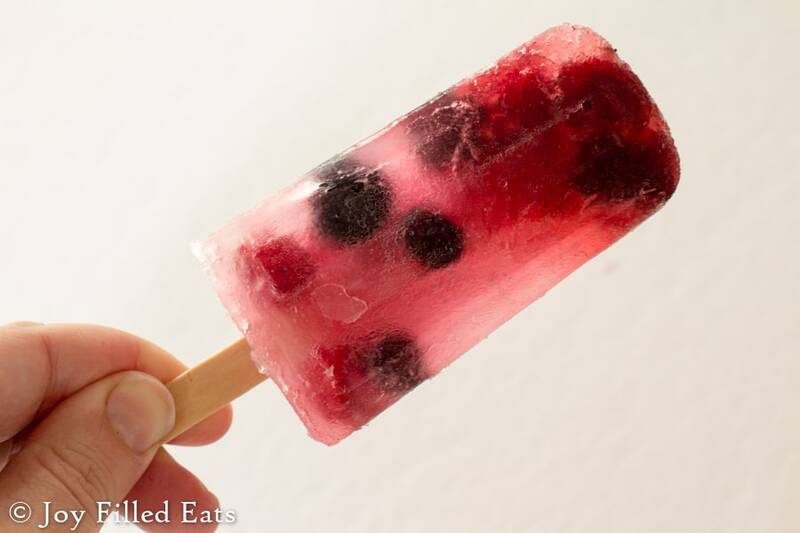 Berry seltzer ice pops are naturally low in calories, fat, and vibrant in flavor! Mix the seltzer and sweetener in a 4 cup measure cup. It will bubble up. 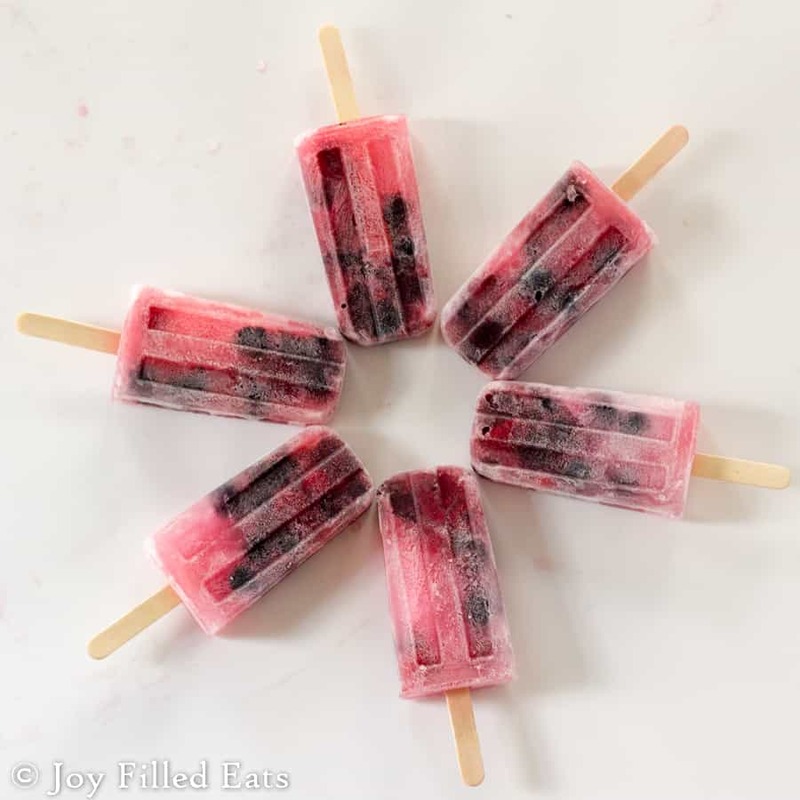 While the bubbles dissipate divide the berries between the pop molds. Pour the sweetened seltzer over the berries. If you have a little extra just drink it. It's delicious! Insert sticks and freeze until firm, at least 6-8 hours. This makes 10 ice pops. You will have to adjust the amount of berries, seltzer, and sweetener to make a lesser amount.